This certainly isn’t the case for all beaches and surf areas surrounding Java, but…photographer Zak Noyle was shooting Indonesian surfer Dede Surinaya in a remote, mostly uninhabited bay and this is what they found. This shot was taken in the formerly pristine waters off of Java, Indonesia. 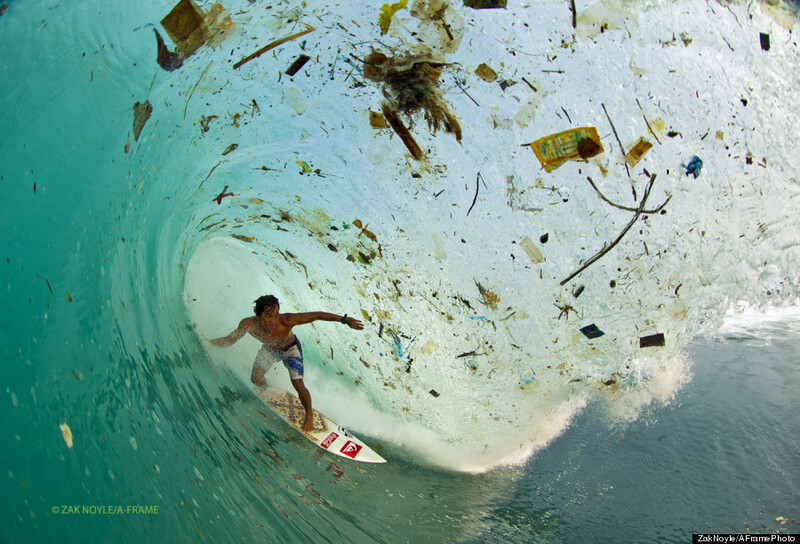 According to several sources, the 17,000 islands of Indonesia have a serious problem with trash disposal. Java, with a population of 135 million people, is the world’s most populated island. Many areas lack reliable, clean waste disposal systems, so many people burn their trash, including plastic garbage. Whatever doesn’t get burned ends up in the most unlikely places, while strong currents can carry trash far from any town or city where it was generated. Looks an ideal testing ground for new ideas for waste disposal infrastructure and technologies on limited land mass. Yikes! I just set a story in the thousand islands, and I had no idea it was so polluted! How very sad! They need to collect and repurpose, something.